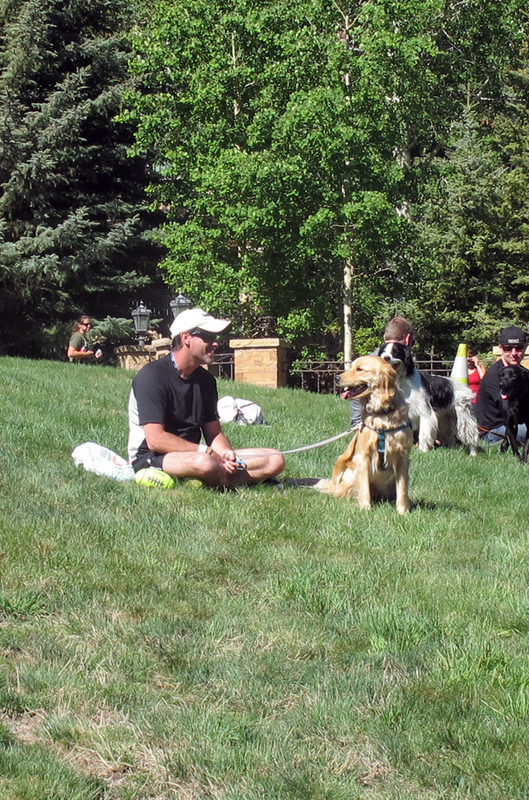 Here in Vail, we take our dogs just about everywhere with us – and you can too! Here’s how to make the most of this dog friendly vacation destination. 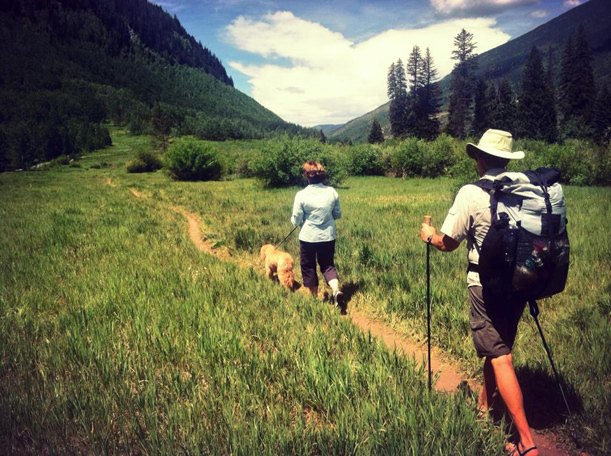 There are many hiking trails around the valley that are perfect for bringing a dog. Look for trails that have streams, lakes, or other water sources along the route so you can make sure your dog is well-hydrated and stays cool. Be sure to get your dog into hiking condition before going on a long or strenuous hike – the altitude can affect them too! Collapsible bowl and water – even if there is water along the trail you want to make sure you bring some just in case…water level in smaller creeks and ponds can vary depending on the time of year and precipitation accumulation. 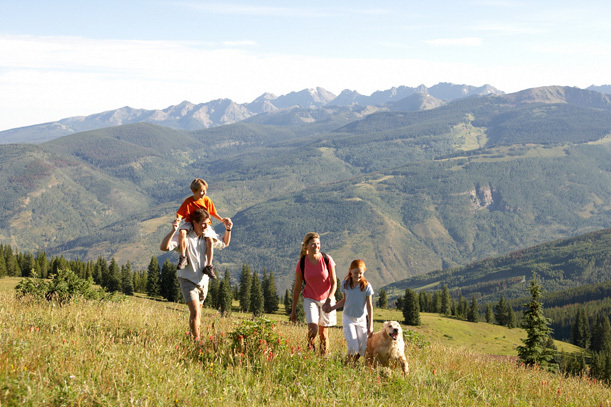 Vail Mountain allows dogs on designated hiking trails on the mountain and has routes for all abilities. Please note that dogs are not allowed to upload the gondola but if you hike to the top, the gondola is free to download both person and pet. Booth Falls and Lake Trail, and Pitkin Lake Trail are both longer hikes with water along the way or at the final destination. (http://www.bringfido.com/attraction/9088/). Gore Lake trail starts from Bighorn Road in East Vail and is a great trail for both dogs and their humans. It is 12.2 miles to Gore Lake, but the trail loosely follows Gore Creek and there are plenty of views and spots to play in the water, even if you don’t make it all the way to Gore Lake. (http://www.protrails.com/trail/summit-county-eagle-county-clear-creek-county-gore-lake). Off-leash dog parks are a fun and convenient way to give your dog some time to let off a little steam. Both you and your dog are sure to make a new friend, and maybe even hear a couple local’s suggestions for restaurants, trails, and fun things to do. Stephens Park Off Leash Dog Park – This park is located in the Intermountain neighborhood of West Vail, and has a field for playing as well as a creek for swimming. There is no fence surrounding this park, so make sure you dog has proper recall skills. Bighorn Park Off Leash Dog Park – This beautiful open space in the scenic East Vail has plenty to keep you , your family and your dog entertained, including a pond and kid’s playground. After a full-day of hiking head into Vail Village or Lionshead where dog-friendly patios are plentiful and offer everything from gourmet dining to a slice of pizza. Bully Ranch – in the beautiful Sonnenalp hotel in Vail Village, this western themed restaurant with Southwestern and American fare offers expansive outside seating. Bart and Yeti’s – a long time Vail institution in Lionshead, Bart & Yeti’s is a laid back spot that was actually named for two dogs. Classic American fare, a nice patio and cozy log-cabin style interior. Vendetta’s – a local’s favorite for pizza and beer, this Italian spot in Vail Village also has good Italian dinners. Quiet deck behind the restaurant is a great place to people watch. Blue Moose – specialty pizzas that include ingredients like crimini mushrooms and truffle oil are balanced with a casual vibe and red-checkered table cloths. Their wrap around patio in the center of Lionshead makes it a great place to linger. Alpenrose – another Vail institution, this beautiful German and Austrian-style eatery is impossible to miss with its classic architecture and overflowing flower boxes. Like La Bottega, their outdoor seating is prime real estate on sunny days. **It’s always a good idea to call a restaurant and check before bringing your dog, as policies are subject to change at any time. Article by local dog expert and Summit Dog Rescue coordinator, Kristie Buse.